When I first said that I will blog about the Knicks every week, I did not know what I was signing up for. The Knicks are really bad at basketball and I do not what else to blog other than just saying that they are straight up trash. The Knicks played three games this week and got blown out in two of three games, the only silver lining from this week is that all three games were against potential playoff teams, so their schedule should ease up this week, and maybe they can try to win a game this week. The first game of the season was against the Thunder in Oklahoma City and the Knicks never had a chance to win the game. The Thunder are probably the second best team in the NBA and that was evident in that game. This game was the first game for Carmelo Anthony in Thunder uniform and it happened to be against his former team, Melo played well but Paul George was the big star of the game. This game was a sign for Knick fans that the Knicks are years away from being in contention for a title. The second game against the Detroit Pistons and it was the Knicks’ home opener in MSG. The Knicks actually played decent in this game, but were not able to close it out and lost by four points. Right before the game, news came out that their first round pick Frank Ntilikina had an ankle injury and will be out for some time. The Knicks are not going to be good this season, but they have to win games at home against times like the Pistons if they want to contend for the last playoff spot. The Knicks third game came against the Celtics in Boston last night and it was a blow out. The Celtics were outshooting the Knicks all game and kept the Knicks scoring to a minimum. 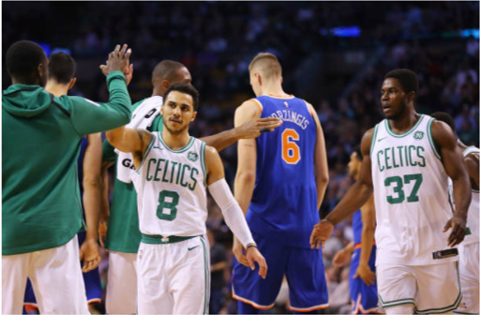 The Celtics are one of the best teams in the East and the Knicks goal should be to get to the level of the Celtics. Kristaps Porzingis is the only bright spot thus far as he scored at least thirty points in the first two game, before only scoring twelve last night. This season’s focus is to develop KP and he is headed in the right direction thus far. There were a lot of dark spots this week, but none to glaring than Tim Hardaway Jr., who is among the worst players in the NBA thus far this season but is one of the highest paid Knicks, he needs to get his act together before fans starting booing him. There has been rumors that some of the players do not know what plays are being run, that is on the coaching staff who have not been good thus far. The Knicks have a lot of issues, but bad coaching should not be one of them. The coaching staff has not been putting the players in the best position to win games. This week the Knicks play the Nets, the Cavs, and the Nuggets. The Knicks can possibly win of the three games, but will they? Probably not 0-82 here come the Knicks!! !